The Houston Museum of Natural Science has everything you want in a natural history museum. Fossils, rocks, interactive displays, rotating exhibits...and all the dinosaurs you stare at. Sure, it looks like the average treat dispenser but if you take a closer look you'll see a menu of science specific snacks and borderline gross grub. Let's start with some of the more traditional fare. 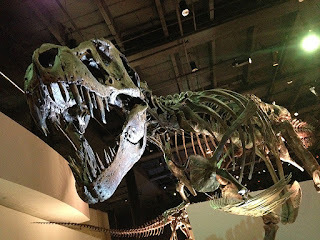 And what's more at home at a museum than dinosaurs? 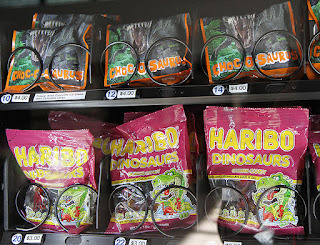 Gummi bears are replaced with Gummi Dinosaurs but the real find here is the top row. Choc-o-saurus is a combination of two museum staples: dinosaurs and freeze dried ice cream! It's chocolate with chocolate chips and, while eating it, you have the option to pretend like you're an astronaut or a extinct predator who loves dehydrated food. Here we've got "Crick-ettes." 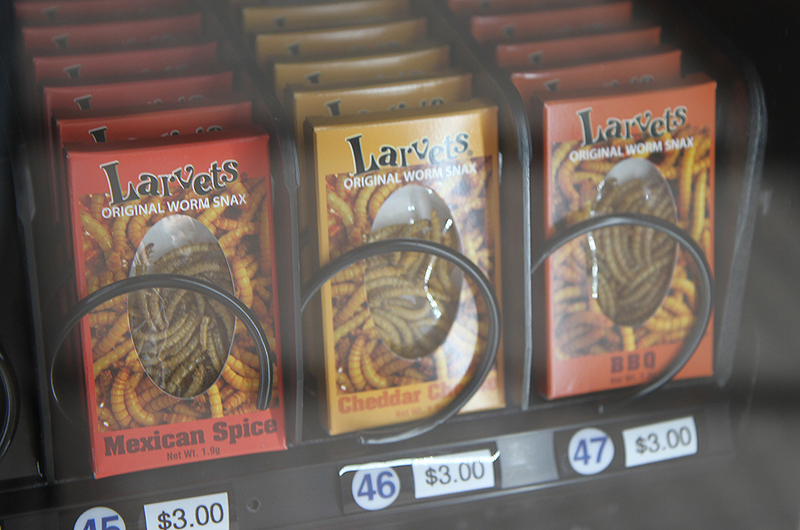 which are, you guessed it, real crickets. 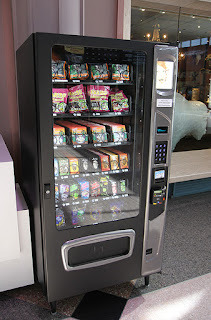 These are Bacon & Cheese flavor but they also come in Salt N' Vinegar and Sour Cream & Onion. And if you're still hungry for bugs, you can also grab some Ant Wafers! 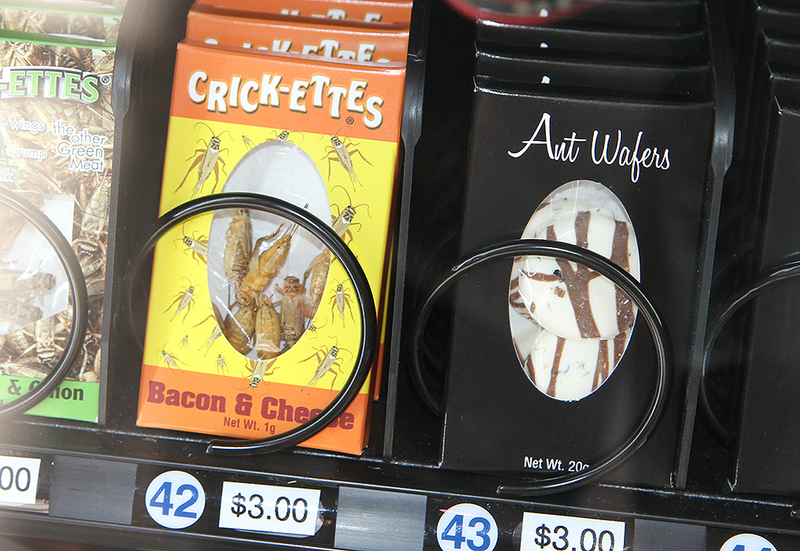 It's essentially what it sounds like: "Real ants in chocolate flavored round wafers." Have you ever eaten hard candy and thought to yourself, "I wish this had ants in it." Then you should have picked #56 or #57 from this vending machine. 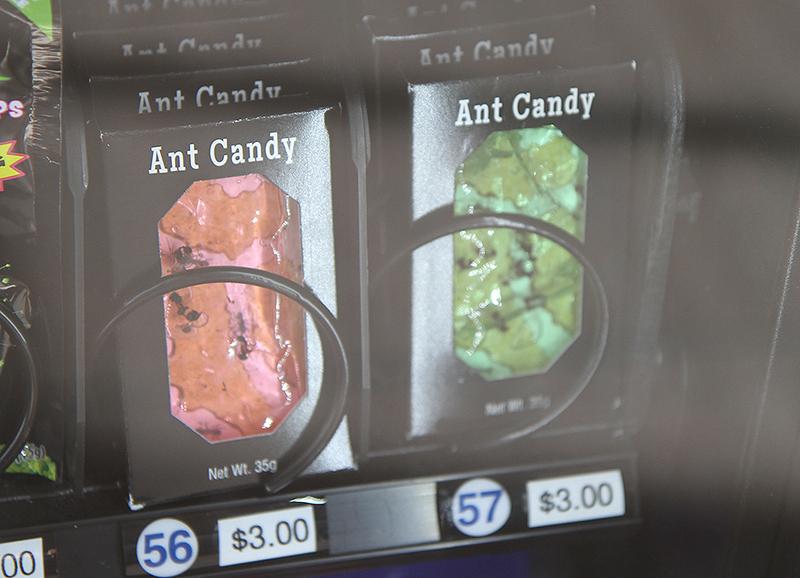 You get the option of either Cherry or Apple flavor, both with Black Ants of course. 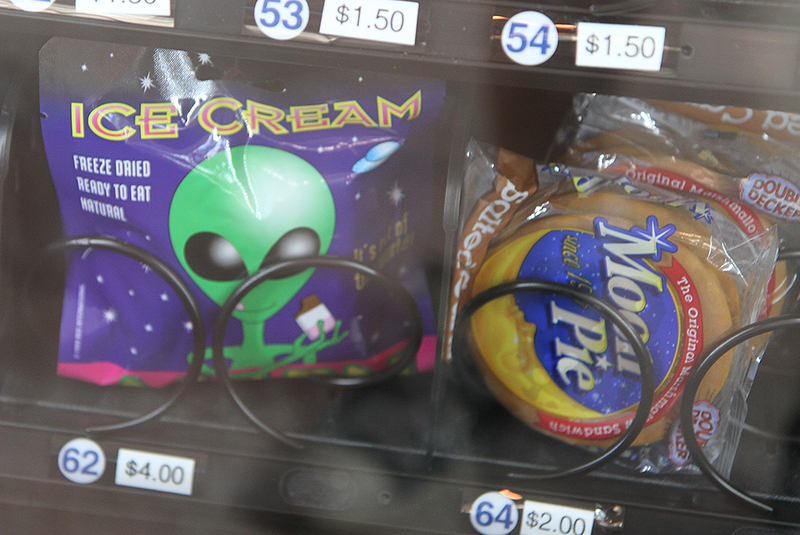 For our final selections we head to outer space for Alien Ice Cream. This another freeze dried ice cream and is your standard Neapolitan flavor but it's either made by or eaten by Aliens. Or maybe there's just one on the package. Or you can have a Moon Pie! Get it? 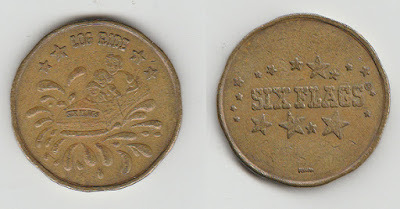 "Moon"
So the next time you head out to the museum, bring some change and an adventurous appetite. 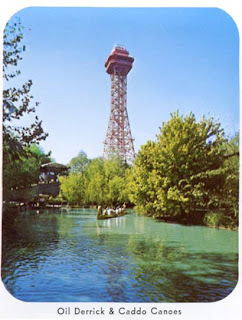 Everybody loves a trip to Six Flags Over Texas. 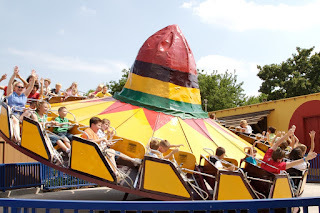 Locals and out-of-towners flock to the park for high speed thrills and kid friendly fun. The amusement mecca has attracted its fair share of camera crews too since the locale looks great on screen. 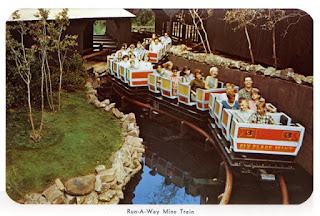 So today we have a couple of examples of when Hollywood came to Six Flags! 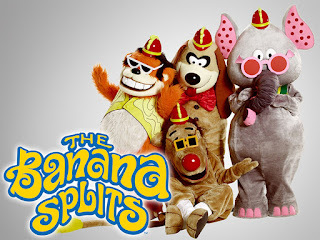 The Banana Splits Adventure Hour consisted of live action costumed characters (an ape, an elephant, a dog and a lion) having madcap adventures, playing music and introducing Hanna Barbera cartoons that couldn't merit having their own show. 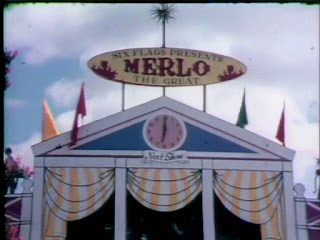 The sequence involves young Butch Patrick (Eddie from The Munsters) running afoul of Merlo the Magician at a magic show at Six Flags. You can see from the sign above that the producers felt no need to hide the identity of the park or try to disguise it as a fictional park. Our last stop at the park involves a much more recent production. Texas native Robert Rodriguez is known for his gritty, violent action movies but he's also been known to make fun kids movies too. So when it was time to shoot an amusement park sequence for Spy Kids 2, you can guess where he went. 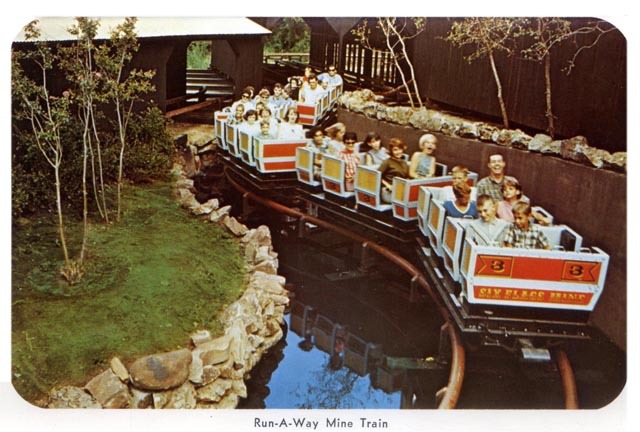 Of course, that's the late, great native Texan Bill Paxton as "Dinky Winks." And that's our last ride of the day. Time to head back to the parking lot for the long drive home. Hope you had fun today and that the lines weren't too long.